Fantech Centrifugal in-line fan features a vibration-welded seam that ensures leak-proof housing. It mounts in any angle at any point along the ductwork and straight-through airflow design for quick and easy installation. This fan with Class B insulation, supports 100% speed control through varying the voltage by using a solid-state or transformer type control. Fan featuring FC type mounting clamps allow removing the fan quickly and easily for services. It delivers airflow up to 324 CFM. Thermoplastic housing ensures greater protection to fan and motor. 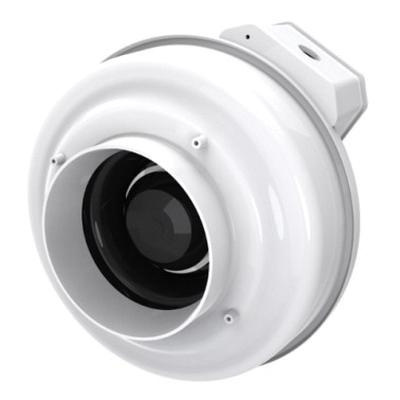 This 2630 RPM fan has voltage rating of 120-Volts, current rating of 0.59-Amp and power rating of 68.3-Watts at 60-Hz. It operates in air stream temperatures up to 140 deg F. It measures 9-1/4-Inch x 11-1/2-Inch. It uses 6-Inch ducts. It has a adhesive caulk that joins and seals the housing. It is perfect for multiple point exhaust, residential and commercial applications, crawl space venting or make-up air supply. It serves as booster fans to move air from one room or area to another. In-line fan is HVI certified and cULus listed.